Have you ever heard of Kyrgyzstan? Two years ago I had no idea where exactly this country was. And this year it was already the second time I traveled to this amazing country in Central Asia. Everything started when Gerrit Beine asked me to join him giving a workshop about agile software development in Bischkek (here some impressions from 2012). This year I was offered the possibility to teach, inspire and learn again in Bishkek, Kyrgyzstan. This time Michel Löhr joined in as the main coach for the agile workshop at KSUCTA University. And it was amazing this time I was already used to the not so good things like infrastructure or air pollution (which has improved in a good way over the last two years) and then on the other side I saw all this beauty! The nature is stunning and looking to those massive mountains just outside of Bishkek is amazing. Hiking in those mountains was even more rewarding and then you had the people of Kyrgyzstan: Awesome! So friendly, hospitable, open minded and curious people it was a wonderful experience. Every day at least two students took care of us by doing activities to explore nature, culture, people or food. Thank you all for making this possible. The 5 days agile software development workshop was a lot of fun where we taught the basics of Scrum. With a lot of games and interactive exercises so that the students could experience the agile culture first hand and learn to work and improve as a team and excel with each iteration. I’m already looking forward to inspire, teach and learn more in this wonderful country called Kyrgyzstan in the next years. Thanks for the great day trip! Winner of the Marshmallow challange. Awesome iterative approach! Ever wanted to experience a soccer stadium atmosphere combined with some intellectual input regarding how to use more of your potential. Well then maybe the Jügen Höller Power Days are something to consider. Saturday 10am the event started in Nürnberg, Germany together with 2200 people and the song “I got the Power” from Snap and immediately the energy level in the hall rises. In this environment it was easy to learn new things. I liked how Jürgen Höller and Mike Dierssen used metaphors to explain their topics. One exercise I really enjoyed was for instance everyone was handed out a 100 centimeter paper yardstick and then was told if you are a man cut it of at 85, for a woman at 90 (to show the typical life expectance). Then you should to some calculations: Start from your current age and depending if you are a non-smoker or smoker, eat healthy or unhealthy, do sport regularly or no sport, … you changed the years (+15,+10,+5, 0,-5). The end result you subtracted from your starting point (85 or 90) and you got your remaining years. Well that was very vividly for me. Sure not everything is in your hand but you can do a good part yourself to stay healthy and increase the odds to live a long and happy life. It is the 11th of May 2014 and after a good night sleep I wake up early in the morning to get ready for my first Triathlon ever. Although I had a good preparation for the first triathlon I was still a bit nervous of what will happen that day. Great that the competition started at 1pm, so enough time to prepare myself. With my bike and all my stuff for the upcoming challenge I took the Munich underground to the famous Olympic Park. And already in the underground I met another participant and funnily he was starting just next to me and it was his 3rd Triathlon. His hints on what to think about in that specific Triathlon helped me to relax a bit. After the check in of my bike and all other stuff what you need for your transition (water, power bar, cycle shoes, running shoes, socks, towel) it was time to change into my triathlon outfit and get ready for the swim in the Olympic pool. I was on my bike and went onto the first of 5 rounds in the Olympic park, to get to know the course. Second round was even better and third was great. But in round 4 I got my first cramp on the bike so I had to slow down a bit and also the course was a bit slippery and very twisting. Then getting from the bike one volunteer shouted to me “You’re a the 5th guy”. Wow so I only lost 4 positions [please still keep in my there were 400 guys still behind me who started later] but hey it sounded great! Transition from bike to running went like this … ok running with my bike to my transition position was good … put the bike back on a pole check … helmet down check … cycle shoes out check … both running shoes on check … wait something is in my left running shoe … 5 seconds I’m thinking is it ok to run like this? 3 … 2 … 1 … NO … so after taking the left shoe off and searching what might be in this shoe I found a … power bar (!!!) [Reminder to myself: Please check next time in the check in procedure if anything is still in my shoes!] ok I put the left shoe on and then something was in my right shoe as well a bit smaller but I decided to check this shoe as well. This time I had to search a bit longer but I found another [but smaller] power bar in my right shoe … then both running shoes on check … change the number from the back to the front check … Great then it was time to get back on track and to the start of the running trail. Funnily the guy from the underground who started 1min behind be at the swimming was now next to me. We had a short chat and then I went of. And all the transition preparation from my trainings camp in Croatia was coming into place. Actually I was feeling very good in my running shoes [without all that power bars] and my pace was good. A former colleague and triathlete athlete found me and cheered me up [Thank you Hannes for your support and the pictures] and then the last 500m to the finish line. Volunteers were handling out water but I refused and just saw the finish line. Wow what a great joy came over me. All this tough 6 month preparation was now paying of and all the endorphins were rushing into my body and with a big smile and hands in the air I was crossing the finish line. WOW what an AMAZING experience. Thanks mate for the hints in the underground! But then things picked up … Beside a core muscle training once per week I started to swim twice per week and after a few weeks the first success was to crawl for 5 then 8 and end of December for 60 lanes (each lane was 25 meters) and in February 2014 I mastered even the 152 lanes which was part of my dream plan for 2014. So swimming wise I was on track. Still very slow but with the confidence to conquer the distance. End of February it was time to participate in my first trainings camp in Malaga and after one week and more than 300km on a racing bike I felt that this is going to become a great sport for me even though my body needs much more race bike training. One trainings camp more (in Porec, Croatia) the confidence and fun for cycling grew further. And for the running part I started in January with very very slow but long runs and the pain in my ankles was gone. And as I love running this was a good sign. April comes and so does my first Triathlon trainings camp. How exciting, after my first cycle camp in Málaga it was now time to put all three triathlon parts (swimming, cycling and running) together for my first upcoming triathlons in May, June and July 2014. Together with the two awesome coaches Sabine and Wolfgang from ESV Ringsee Ingolstadt, Natalie and Karin we had one week of training in Northern Croatia in the small beautiful coastal town Poreč. Training conditions were very good: Sunny weather, Plenty of good food, hilly surroundings for our cycle tours, great running track on the coastline and a salt water pool. Long time no update from my site and thus a short flash back to February when I went to my first ever trainings camp to Spain to learn Cycling on a race bike. Together with some experienced cycling mates I was on my way to southern Spain, Malaga. We arrived there end of February and for one week the hills around Malaga were our training grounds. Especially one hill which went up from 0 to 965m was twice part of our course. Amazing to cycle over 1 hour only up a hill, great fun. Daniel my room mate and long time cyclist. Thanks for the great time! Daniel, you were a great room mate! Traveling around the world for me is about meeting awesome and inspiring people in interesting places AND to learn new skills. Recently I stumbled on this article in which a great approach from Tim Ferriss was explained. In the last three month it was swimming for me. I started out with 1 lane of crawling and then I was already exhausted. The goal was 152 lanes. And now after less than 3 month I can crawl those 152 lans. How is this possible? First of all I had a written Dreamplan to help me focusing on the goal. Second I tried to deconstruct the task into small pieces. And then after weeks and weeks of practicing the small pieces, I was finally putting it all together and it worked! Breathing was not a problem anymore and swimming felt almost like running for me and I can now meditate while swimming. It’s brilliant and now I love swimming!!! So what is it, that you always wanted to learn? Give it a try and learn something you always wanted to achieve! I just returned from a run in snow and rain and was surprised how happy this made me feel. You should probably know one more thing: I don’t like cold weather, I love the beach and the sun … but snow and rain with 0°C … bbbrrr no way! Somehow I still enjoyed that. And I had the same experience one month ago when I actually started to enjoy swimming in the pool and I was somehow in a flow while doing this. 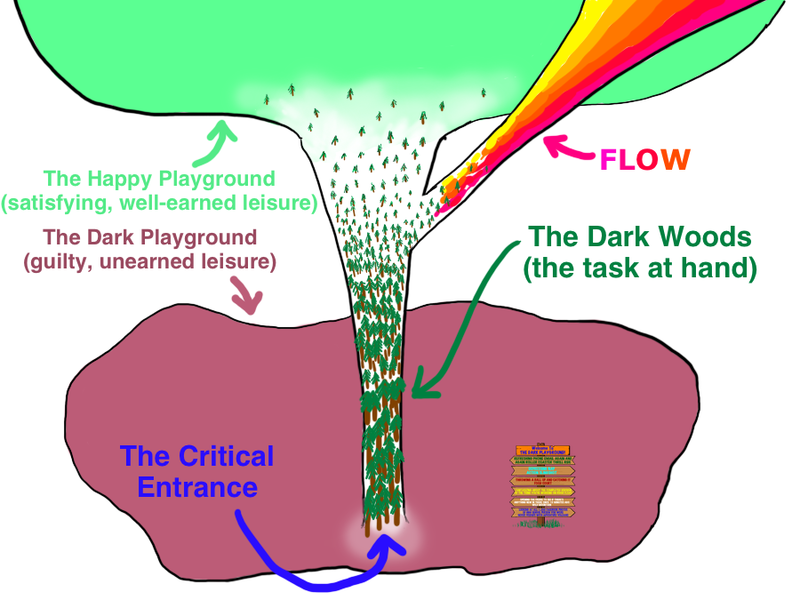 with a wonderful picture (Source Waitbutwhy.com) which explained it perfectly for me. Where is your inner weaker self so strong that you are still in the dark woods?